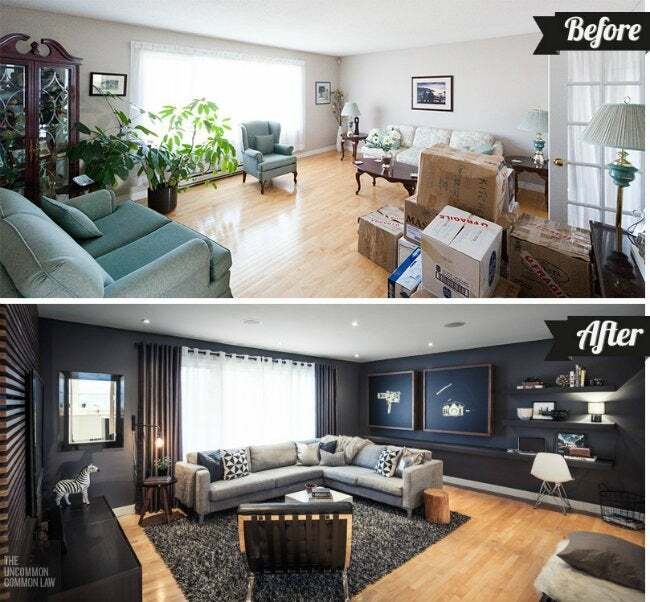 Stuck with limited lighting and excessive pastel left over from the previous owners, these Canadian homeowners rolled up their sleeves to DIY a more modern living room. Step inside to see the dramatic makeover. 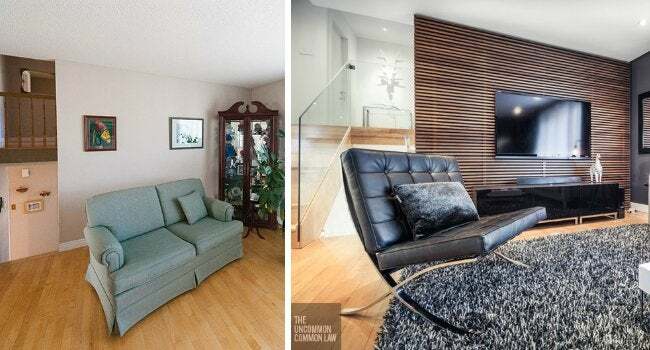 Since 2011, Becki Peckham and Chris Nicholas have been hard at work remodeling their home in eastern Canada, all the while blogging their experience at The Uncommon Law. When they began work, the house had a long way to go before it would reflect the couple’s modern, unconventional design sensibilities. The living room, in particular, shows what Becki and Chris can do when they flex their creative muscles—and their actual muscles, since they did almost everything themselves. Today, the living room channels the couple’s shared love of photography and film, from the moody lighting to the vintage camera display. “We even made backlit light boxes, which feature actual X-rays of an old 35mm camera and Super 8 camera,” Becki says. Overall, Becki thinks the living room makeover, represents “sort of a fusion of both of our professions, photography and radiology.” Scroll down to see the dramatic difference that DIY dedication can make! What was the space like before you got started? It was very ’80s. When we first saw it, the previous owner had furniture there—and the layout wasn’t ideal. The room is quite large, and the furniture was all pushed against the walls, leaving a large, empty space in the center. There were no ceiling lights, and the trim and wall color were pretty builder-basic. Sounds like a pretty blank slate. What was your end goal for the redesign? We wanted to create a moody/loungy media room that was both modern and stylish. 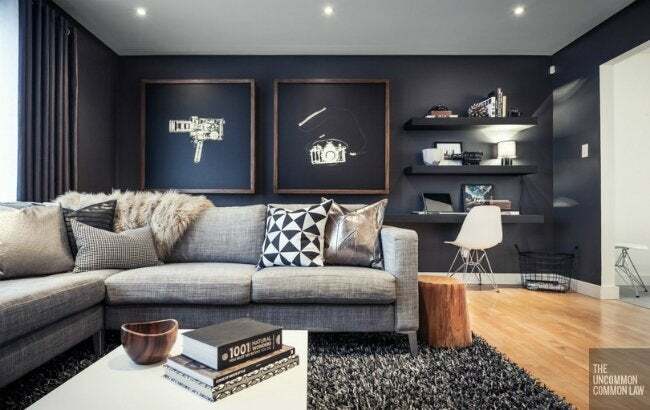 We had actually found an ad in a magazine for the company Minotti and fell in love with the style: a dark room which contained a light gray couch and dark wood/walnut accents. That’s where the initial design inspiration came from. What was the biggest challenge? Did you find yourself having to make any compromises along the way? We definitely had a few challenges with this space. Figuring out how to drop the ceiling and create a reveal to hide LED mood lighting took a bit of planning. Then having the plastering done only to find a leak was very trying. But the slat wall was probably the most challenging, because of all the work it took hand-sanding, pretreating, staining and clear-coating the wood. There were over 640 linear feet of wooden 1x2s that required manual preparation. As for compromises, Chris and I originally wanted a propane fireplace, but it was really out of our budget. 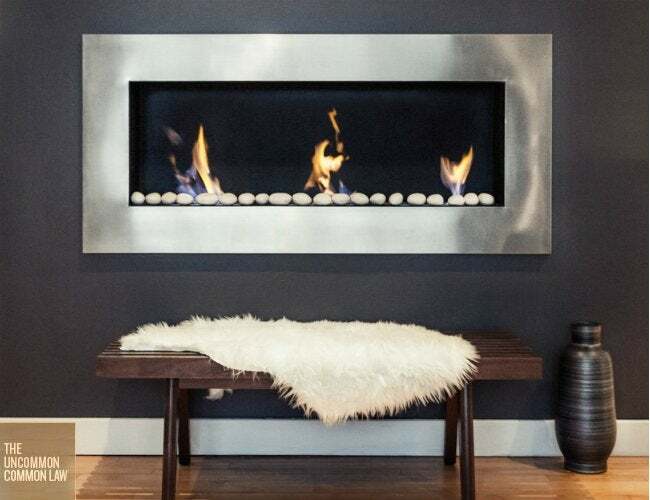 We ended up settling on an ethanol fireplace; it had a similar feel but was much more affordable. You did a lot with the room: built a slat wall, installed heavy-duty floating shelves, mounted an ethanol fireplace, even lowered the ceiling. Tell us a little bit about the thought process behind these choices. We wanted different parts of the room to have different functionality. Using a sectional and adding the floating shelf/desk on the back wall helped with this. The fireplace wall with bench underneath acts as its own little area as well. The media wall started out as a simple feature wall that we were going to paint a different color. This evolved to wallpaper, then wall tiles, then finally to the idea of a full-blown wooden slat treatment. Our ideas always seem to snowball until we realize we’re knee-deep into a project that’s 50 times the work of the original idea! The ceiling was stucco and we were going to just drywall over it, but Chris had the idea of recessing LEDs around the edge of the ceiling in a reveal. We scraped the stucco from around the perimeter of the room, strapped out the old ceiling, installed the new drywall so it stopped about 1.5 inches from the wall, and added J-trim for a nice clean edge when we plastered. Which piece of the room are you most proud of, and why? I think we are both most proud of the slat wall. We love the way it looks, especially at night, and we get a lot of compliments on it. We also have seen a few people making their own, so the fact that we’ve inspired others enough for them to take on such a hellish task is flattering. If you consider the adjacent staircase part of the living room, then the DIY frameless glass rails are also something we’re pretty proud of, if only because so many people told us it couldn’t be done. Without a doubt, a fresh coat really helped set a tone for the rest of your room. Any painting tips that you swear by? Paint can make all the difference in a room. The plasterer we use (when we’re too lazy to do it ourselves) taught us a few tricks that have changed the way we paint—like back rolling. After initially rolling on about three roller widths of paint, go back and re-roll over the section you just painted, only rolling top to bottom. It gives a perfect, uniform finish. Also, quickly give the wall a light sanding between coats of paint to knock down any rough spots on the wall. As for paint choice itself, we are huge fans of matte paint. Maybe not the best choice for families with kids’ hands touching the walls all the time, but the matte finish gives the walls a flat, creamy look, which we love. It also hides any imperfections in the plastering. Looking at it all now, how has this makeover changed the way the space is used? What needs did it meet for you and Chris? This is our day-to-day room. We hang out here, watch movies here, and sometimes eat meals or work here. It’s really a multipurpose space. We didn’t want to have a room that wouldn’t get used much, so we made sure to load it up with things that would draw us to the space. Having the built-in shelf on the back wall double as a desk, for example, gives Chris a place to do his studies or a place for us to sit and write the blog.